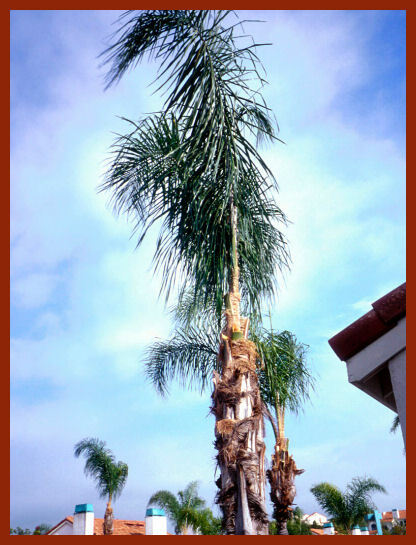 Over Pruning / Palms - Over pruning is to palms as topping is to dicot trees. The meristem is the first to suffer. Stem thickening is disrupted. Then later, problems start that are blamed on pathogens other than the ones that did the primary injury. Whether it is palms or dicot trees, over and over again so many of the problems are started by people. I know why dicot trees are topped and palms are over- pruned; because that is what the customer wants and to stay in business you must provide this service. Remember, a drug pusher gives a customer what he wants. A professional medical doctor gives customers what they need! Picture is a palm over pruned!